There are many 360 cameras on the market now but only a few of them can capture in 3D 360. TwoEyes VR is a new fully spherical 3D 360 camera with 4k video resolution. It is by far the most affordable fully spherical 3D 360 camera, at just $399. Update: TwoEyes is now available for preorder. See here for details and here is a hands-on report and a sample 3D video. TwoEyes VR has four lenses, each with 180-degree coverage. A pair of the lenses are separated from each other by a little less than 3 inches to provide a 3D view. On the opposite side is another pair of lenses that are also similarly configured. – Micro SD storage up to 32GB. 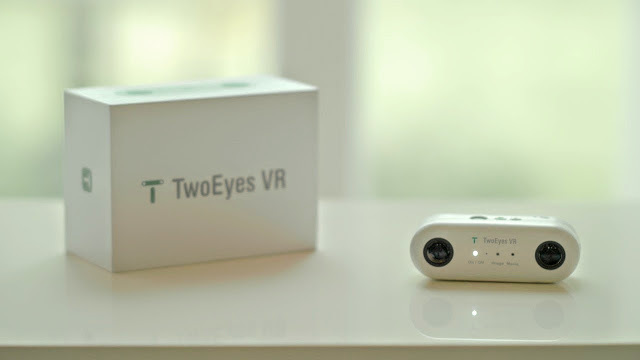 TwoEyes VR is designed to be user-friendly and the package includes a tripod / handle. The release date for TwoEyes VR has not yet been announced. 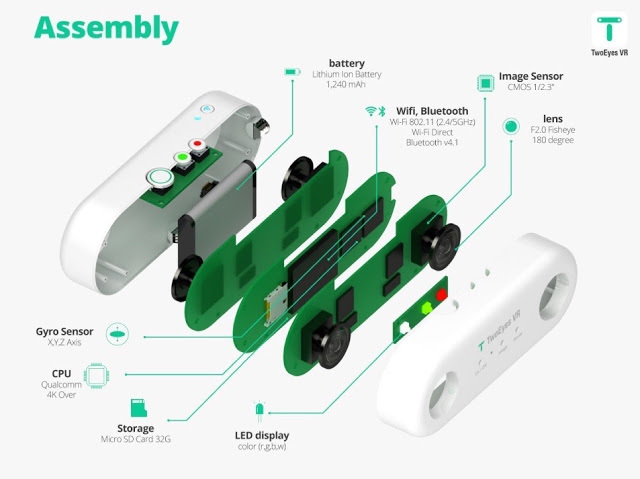 There is an Indiegogo crowdfunding campaign planned for August. 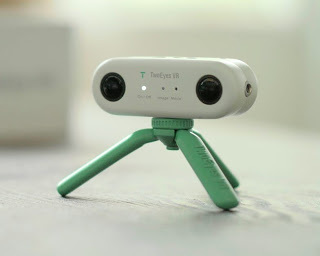 TwoEyes VR is made by Arcinteractive, Inc. of South Korea, which also makes Turnble, a multi angle camera system that provides a 360 degree view around a subject. TwoEyes VR will be competing with Vuze, a fully spherical 3D 360 camera with 8 lenses (due in October), LucidCam, a hemispherical 3D 360 camera with 2 lenses (due in December), and Insta360 Stereo, a hemispherical 3D 360 camera with 2 lenses.